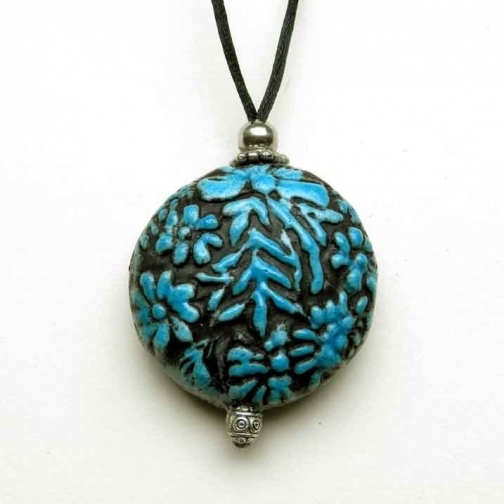 This raku medallion urn can be worn as a pendant, hung in a remembrance nook, or kept with you in its velvet drawstring pouch. It could even hang from the rear view mirror in your car. It has an adjustable cord you can make any length you like. The medallion is shaped like a rounded, flat pebble, about 1 3/4" across, and about 1/2 thick. 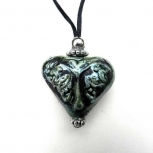 It has a distinctive, carved floral design, a smooth back, and sits comfortably in your hand. It is reminiscent of a Victorian snuff bottle. After the medallion is filled with ashes, the stopper bead is sealed permanently in place. I will send you instructions on how to fill it easily. 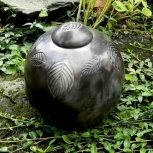 Though this urn is durable and well made, it is not waterproof or designed for continual wear. If you order more than one, I will give you a 10% discount. Please remind me when you order. I will refund any excess shipping charges on multiple item orders. Item ships from: Trent Lakes, ON, Canada. $20.00 CAD by Can. Post. I keep the costs for shipping your item as low as possible. My shipping rates are what Canada Post charges, plus my expenses. If you order more than one item and I can pack them together, I will send you a refund once your payment clears. I try to send out orders the next business day. My urns with mounted crystals or fossils take an extra day as I wait for the jeweler's grade epoxy to permanently cure. As my wares are breakable, I need to pack them well to limit breakage. 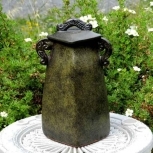 I ONLY ship my medium and large urns & sculptures by Xpresspost so they will arrive quickly and safely. If a package arrives damaged, please photograph it before you open it. If the goods inside are broken, please take a pictures and email me them all. Canada Post will only compensate me if the package is damaged. I will refund your shipping & item cost if goods do not arrive intact.